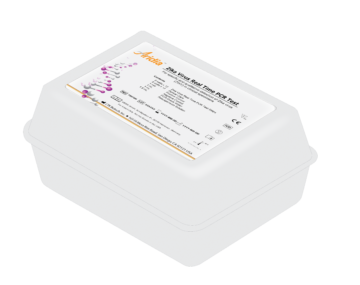 The Aridia T. pallidum Real-Time PCR Test is based on the real-time amplification and detection of T. pallidum in a one-step format. The test is designed for specific and qualitative detection and differentiation of Treponema pallidum in clinical specimens as an aid in the diagnosis of T. pallidum infections alongside all available clinical and epidemiological data, patient history, and other laboratory test outcomes. The product is intended for use by professionals specifically trained in nucleic acid amplification techniques and in vitro diagnostic procedures. Any person exhibiting genital lesions or ulcers, which generally appear 2-3 weeks after sexual transmission and infection. T. pallidum DNA is detectable in clinical specimens obtained from swabs of genital lesions. A positive PCR test is confirmatory of infection. A negative PCR test does not exclude infection and should be followed up with additional serological diagnostic testing. All test results should be evaluated by a health care professional in the context of clinical symptoms, epidemiological information, patient history, and other diagnostic test results. Limit of Detection: PCR reactions containing ≥50 T. pallidum copies are detected as positive ≥95% of the time and reactions containing ≥10 T. pallidum copies are detected as positive ≥90% of the time.